RS - 100 For GI Industries TCM-1000 includes: Seals, bearing, V-belt, shaft pulley, O-ring, inlet. SR- 200 Complete Tune-up. Diagnostics of machine. Replace V-belt, O-ring, internal shaft seal, manifold bearing, inlet screen, and new pulley. Align motor and pulley, lubricate components, polish drive shaft, hone and clean manifold, check and inspect electrical system, and grease bearings (where applicable). GI Industries can provide parts and service on your existing equipment tube cleaning machines. 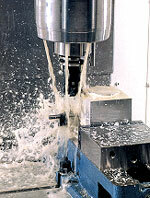 Our machining center offers custom machining and parts. It’s easy to establish an account. Give us a call and we can generally open an account within one day. Or Click Here to register online. If you have product application questions, need a special product, or have questions about your order, just call our toll-free number for immediate assistance.